The name Piasa is an Illini word meaning "The bird that devours men" and according to their legend children and adults were carried away and eaten by this bird or dragon monster. "...a pair of monsters, each as large as a calf, with horns like a deer, red eyes, a beard like a tiger, and a frightful expression of countenance. The face is something like that of a man, the body covered with scales, and the tail so long that it passes entirely round the body, over the head, and between the legs, ending like that of a fish." Native American Indians were a deeply spiritual people and they communicated their history, thoughts, ideas and dreams from generation to generation through Symbols and Signs such as the Piasa symbol. The origin of the Piasa symbol derives from the ancient Mississippian culture of the Mound Builders of North America and were major elements in the Southeastern Ceremonial Complex of American prehistory (S.E.C.C.). Some Indian tribes still retain some elements of the Mississippi culture. Their sacred rites, myths and symbols, such as the Thunderbird symbol, are presumed to descend from the Mississippians. The Piasa symbol featured strongly in the Mississippian culture. The Piasa was believed to be a supernatural deity, similar to a dragon or mythical bird, who resided in the Underworld with the spirits associated with death and destruction. The Piasa is seen as a malevolent being or monster, part bird, reptile and mammal, who fights then devours his enemies and was strongly associated with warfare. The Piasa symbol picture above shows these bird, or dragon like, creatures with horns. Antlers and horns signified spiritual power, especially when applied to animals that did not ordinarily have them such as Birds, Panthers and Snakes (Serpents). 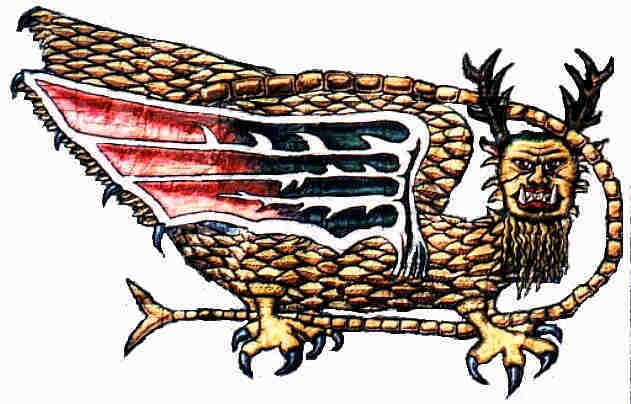 The Piasa symbol also depicts this bird monster with the body parts of other animals. The tail is long and undulating reflecting snake or serpent like similarities. The feet of the Piasa has the wings and claws of a bird of prey. For additional information refer to Mythical creatures and monsters. The most ancient Native American Indian symbols, like the Piasa symbol, came from the Mississippian culture which was established in 1000AD and continued to 1550AD onward. The Mississippian Native Americans were the last of the mound-building cultures of North America in the Midwestern, Eastern, and Southeastern United States. The Mississippian culture was based on warfare, which was represented by an array of emblems, motifs and symbols. The Mississippian culture warrior icons like the Piasa symbol provides interesting history and ideas for tattoos that include cosmic imagery depicting animals, humans and mythical beasts. The Mississippian Native Americans practiced body painting, tattooing and piercing.